Claude Schaefer [1913-2010], Montevideo, Uruguay; sold 1950 to Lessing J. Rosenwald;  gift 1950/1951 to the National Gallery of Art. In Recollections of a Collector, 1976, p. 56-57, Rosenwald described being approached by a young man in South America who offered to sell his father’s collection of prints that he had brought with him from Germany. Rosenwald gives the year as 1951, but his appointment books confirm that it was actually 1950 - he left for Buenos Aires on 9 February 1950 and returned on 20 March 1950 (Library of Congress, Rosenwald Papers, Box 75). Rosenwald writes that he bought the entire collection of some 1100 prints and drawings, but as they had already been scheduled to be sent to Europe they came to the United States via Antwerp, arriving in the US in late April 1950. Rosenwald decided to keep about a quarter of the collection, destined for the National Gallery of Art, and donate the remainder to other institutions. The inventory log of Alverthorpe indicates that just over 300 works were accessioned there in May of 1950, inventory numbers 50.260-50.530, acquired from Claude Schaefer (Gallery Archives, National Gallery of Art, RG 45A1, Rosenwald Papers, Box 41). Kornfeld, Eberhard W. and Peter A. Wick. 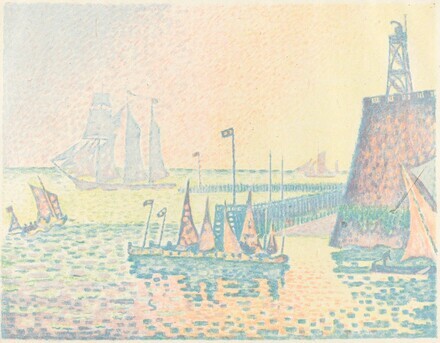 Catalogue raisonne de l'oeuvre grave et lithographie de Paul Signac. Bern: Editions Kornfeld et Klipstein, 1974.